Before you send out the link to your newly created profile update form we recommend you test it. There are two ways to test a profile update page. 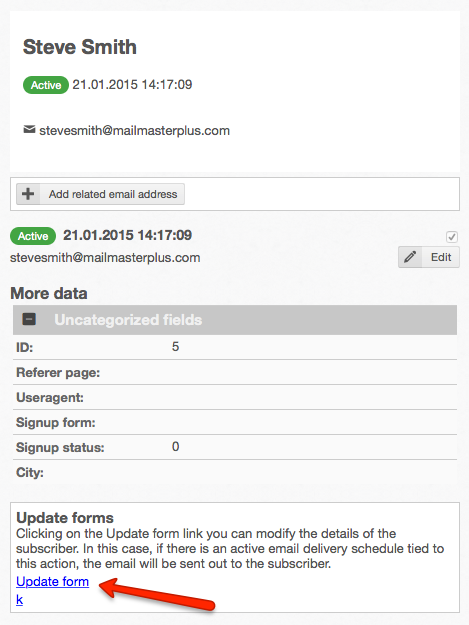 The first is to create an email and insert the merge tag of the update form into it. Send the email to yourself with a test delivery. Click on to the link in the email. If everything is going right the personalized profile update form will be displayed in your browser. Modify some of the date in the form and click the "submit" button. Check the confirm page if it is proper. If an "Update" type delivery schedule belongs to the form check whether the email has been sent. The selected users will receive email notification about the profile update. If your user was selected at the email list notifications you should have received the notification about the profile update. If there are any actions set to the form check if those have triggered. There is an easier way to test your form, open a subscriber's profile page (click the email address in the subscribers list), and at the bottom of the profile page you can see profile update forms of the list. Click on the name of the form to open it. It will open into a new window. The update form behaves as if it were opened by the subscriber. So if there is "Update" type delivery schedule assigned to it the email will be sent and the actions will have triggered also.